My SAE is very diversified to say the least. I have multiple entrepreneurship SAE’s including Dairy Production-Entrepreneurship where I raise and maintain 30 dairy cattle. I market the milk to a nearby cooperative. Poultry Production, where I raise both black jersey giant hens and silver laced Wyandotte hens. I market the eggs throughout my community and show these hens in the local and state fairs. The final aspect of my SAE is agricultural education placement, where I serve as an educator for more than 75 kids, teaching them about various agricultural topics. 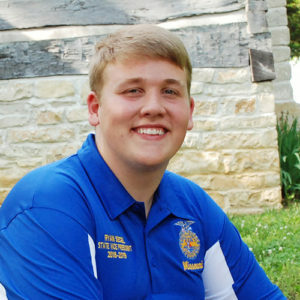 One of my biggest goals this year is to establish vital connections with the members of Missouri FFA. I believe that to assist members in unlocking their confidence and potential, they need to realize that they have the help and guidance of a state officer. Just like the state officers my freshman and sophomore years inspired me and made me feel like the most important person in the room, I want to give each and every member this year that moment in the spotlight. The person who has always motivated me the most is my mother. I believe that my mother is my biggest inspiration and role model. Throughout my entire life, she has pushed me to be the greatest that I can be, helped me get through those times of struggles, and instilled a motivation in me that will help me carve a path for my future. Though she has been through many struggles in life, she will always be by my side as my No. 1 supporter, and she truly has made me grateful for all the sacrifices that she has made. My plans for the future are to attend the University of Missouri-Columbia to major in Plant Science. After I obtain my bachelor’s degree, I hope to continue my education through grad school obtaining a master’s degree in Plant Stress Biology, and a doctorate in Plant Genetics and Genomics. After I finish schooling, I hope to work for a research company benefiting the greater good through enhancing and developing new projects that feed the world. I play four musical instruments. Throughout my life, music has always been something of interest to me, I have played the trumpet for four years, saxophone for two years, piano for six years, and ukulele for about a year and a half. I also have been in musicals and concerts for both band and choir. My biggest piece of advice to FFA members is to seize every opportunity you are given. One of my biggest regrets as a young member is not immersing myself and challenging myself enough within the organization. So apply for Helping Youth Prepare for Excellence (HYPE) Academy, Helping Youth Maximize Agricultural Experiences (HYMAX) Academy, Missouri Agribusiness Academy (MAbA), Animal Science Institute, Pork Institute, or whatever your heart desires. Challenge yourselves with Career Development Events (CDEs) or LDE’s that are out of your comfort zone. If you fail, that’s okay. Defeat is only success in the making.